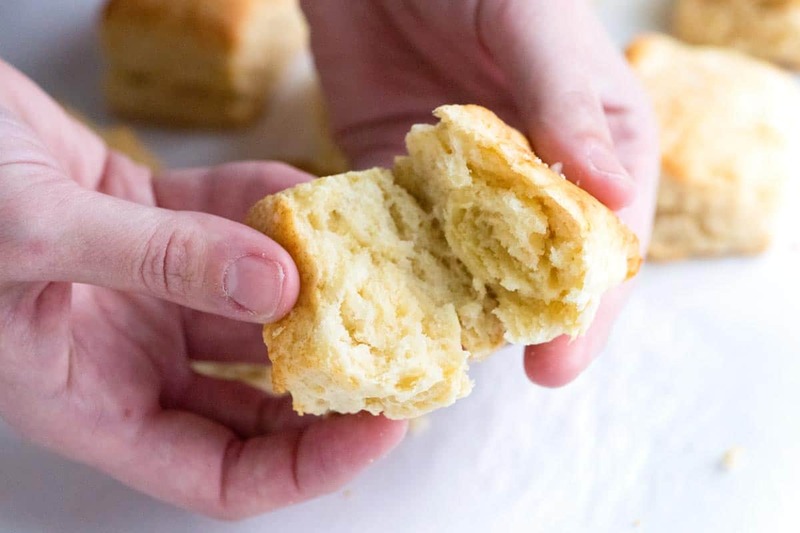 How to make buttery, flaky buttermilk biscuits. 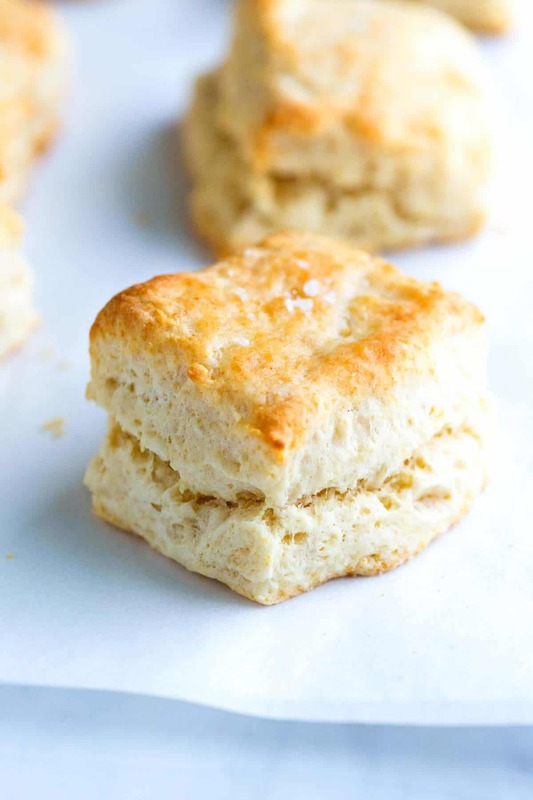 Jump to the Easy Homemade Buttermilk Biscuits Recipe or read on to see our tips for making them. There are lots of opinions for how to make biscuits — some might even tell you you’re making them wrong. We didn’t grow up in a Southern kitchen and we didn’t have a Grandmother making biscuits for us (although, we really wish we did). Instead, we love all things butter and so we’ve spent the last few weeks making batches, after batches of biscuits (not complaining). YOU MAY ALSO LIKE: How to make perfectly light and flaky scones packed with dried cranberries and orange zest. 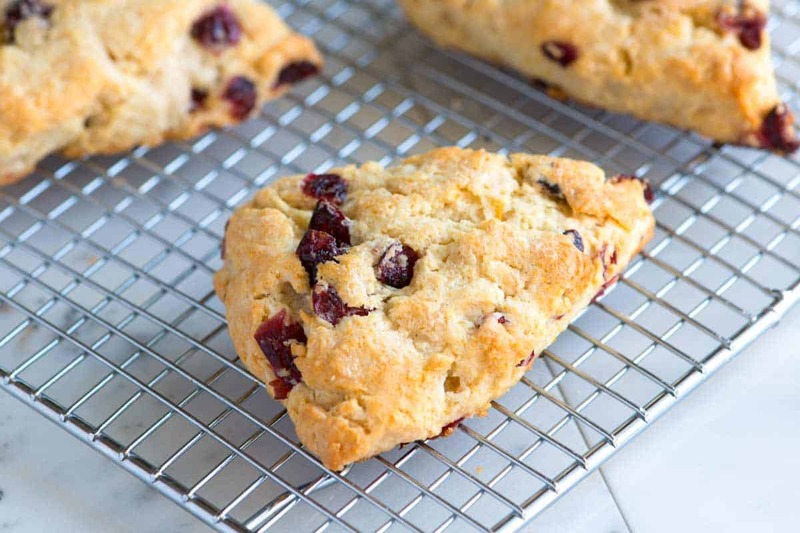 Jump to the Cranberry Scones Recipe. 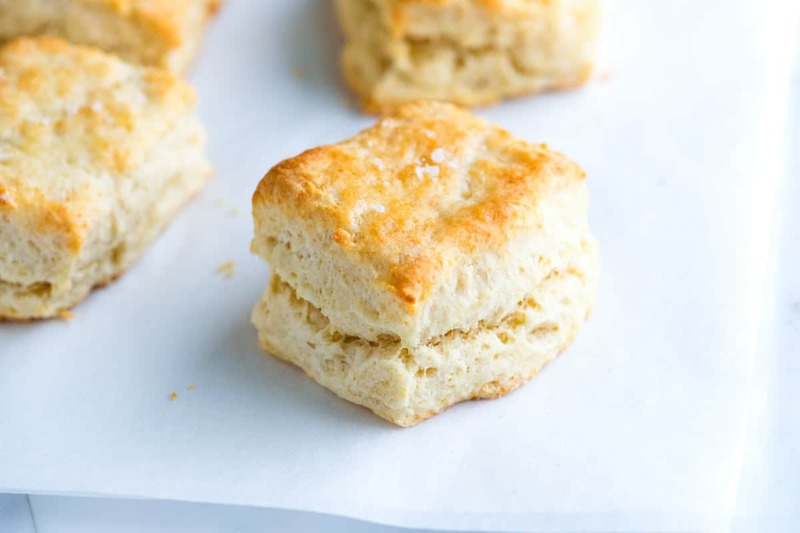 Here’s what we’ve come up with — A no bowl recipe for buttermilk biscuits. Just a few simple ingredients plus your countertop can come together to make flaky, tender biscuits ready to be topped with jam, a fried egg or dare we say it, more butter. Most recipes for biscuits will call for very cold fat, flour and some type of leavener, usually baking powder, baking soda or a combination of both. Our recipe is no different. What we do differently is more about how we work the fat, in our case, butter, into the flour. 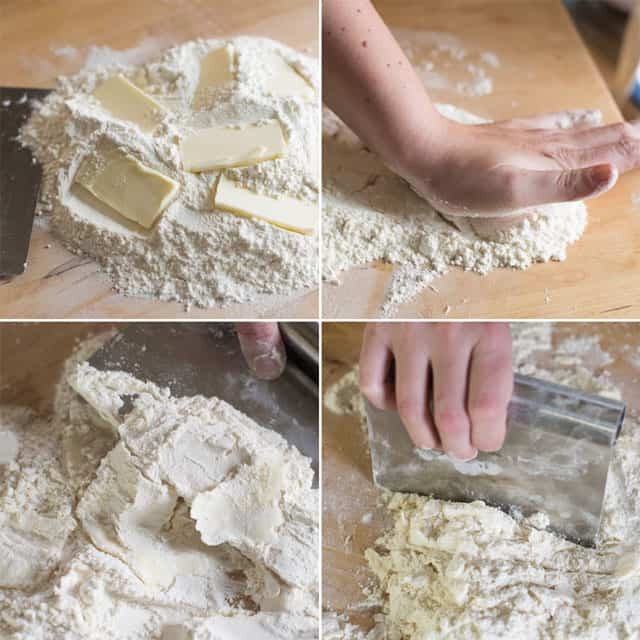 Instead of using a pastry cutter, a food processor or our hands and a bowl, we dump everything onto our countertop and use the heel of our hand to repeatedly smear the cold butter into the flour until the butter turns into thin flakes. You really don’t need a bowl for this and everything is done on the countertop. 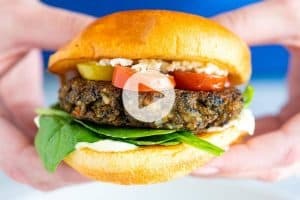 It’s pretty quick and if you’re a food dork like us, it’s fun, too. Step one, Scatter thin slices of very cold butter on top of a mound of flour (with baking powder, baking soda and some salt mixed in). Step two, Toss the butter in the flour until coated then use the heel of your dominant hand to press the butter slices down and away from you into the flour. Step three, Use a pastry scraper to scrape the pressed butter and flour up then place it on top of the pile. Continue to to press and scrape until the mound has more flakes of butter than loose flour. This takes about 2 minutes. Step four, Use the pastry scraper to cut the larger flakes into smaller ones. The mound should now look more like a combination of small flakes and crumbs. (Just in case you were curious, this technique is called frisage. It’s often used when making pastry dough, tart dough and even cookies). Once you’ve pressed and smeared all the butter into flakes, you can add the buttermilk. Just make a well and pour it in. Then use a fork to gently work the buttermilk into the mound until a crumbly dough forms. Form the dough into a ball and press into a rectangle. We skip the biscuit cutters and just cut the dough into squares, but you could just as easily cut them into circles. YOU MAY ALSO LIKE: How to make perfectly flaky scones with fresh blackberries and lemon. 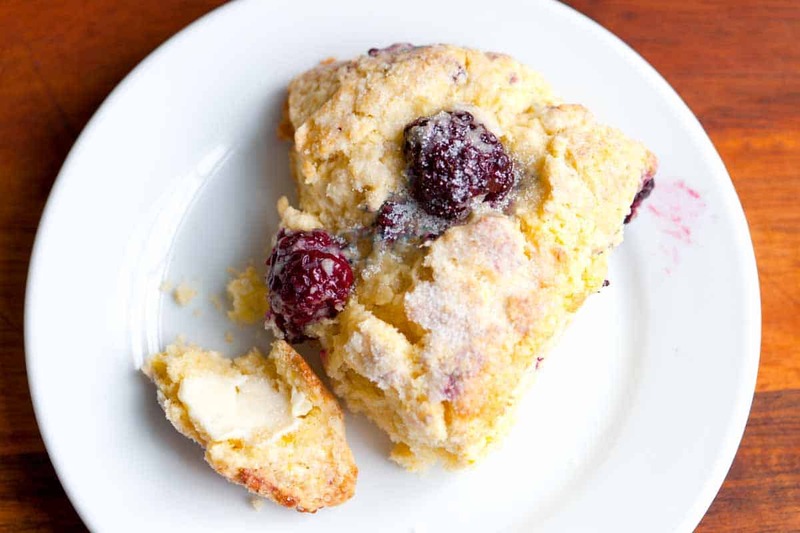 Jump to the Blackberry Scone Recipe. Just a few simple ingredients plus your countertop can comes together to make flaky, tender biscuits. Take a look at our notes below for tips about salt, using milk in place of the buttermilk and how to make your own buttermilk at home. 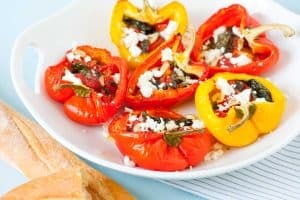 Heat oven to 450 degrees F and line a baking sheet with parchment paper or a silicon baking mat. 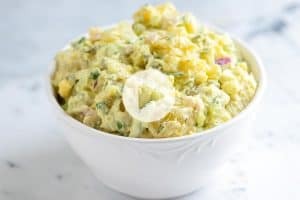 Place butter into the freezer for five minutes so that it’s thoroughly chilled Meanwhile, sift or whisk the flour, baking powder, baking soda, and salt together then dump into a mound on your countertop. Cut the butter into large, thin pieces and lay them on top of the mound of flour. Flip the butter in the flour so that it’s well coated. Press the butter slices down and away from you into the flour with the heal of your dominant hand. Then with the other hand, use a pastry scraper to scrape up the pressed butter and flip it over onto the top of the mound. Continue to press and scrape until the butter turns into thin flakes pressed into the flour, about 2 minutes. Once you see more butter flakes than loose flour use the pastry scraper to cut the flakes up so that you end up with an assortment of small flakes (similar to the look of large rolled oats) and some crumbs. Make a well in the middle of the mound then pour in the cold buttermilk. Using a fork, gently work the buttermilk into the flour mixture until a very loose dough forms. If the dough seems too dry, add an extra splash of buttermilk. Scrape up the dough with the pastry scraper and fold it over itself a few times until it comes together into a scraggly dough. Use your fingers to gather it into a ball then press into a rough rectangle, about 9 inches in length. For square biscuits, use the pastry scraper to cut the edges away from the rectangle, which helps all sides of the biscuits to rise more evenly. Then, cut into twelve squares. Or, use a round biscuit cutter. Reduce the oven to 425 degrees F. Arrange biscuits about 1 inch from each other on the baking sheet. Bake biscuits until doubled in size and light golden brown on top, about 10 minutes. Brush tops of hot biscuits with a little butter and sprinkle with a pinch of salt (or sugar). Enjoy warm. Replace Buttermilk with Milk: We have made these biscuits using milk in place of the buttermilk. They loose some flavor, but are still quite good. You may find you need less milk than buttermilk, so add a little less milk at first then see if you need to add more to form the dough. Make Your Own Buttermilk: Combine 4 1/2 teaspoons of white vinegar or fresh lemon juice with 1 cup of milk. Stir then let stand for 15 minutes. (The mixture will curdle). Use as needed in our recipe above. If you do prefer, use a pastry cutter to cut the butter into the flour instead of using our method in the recipe above. 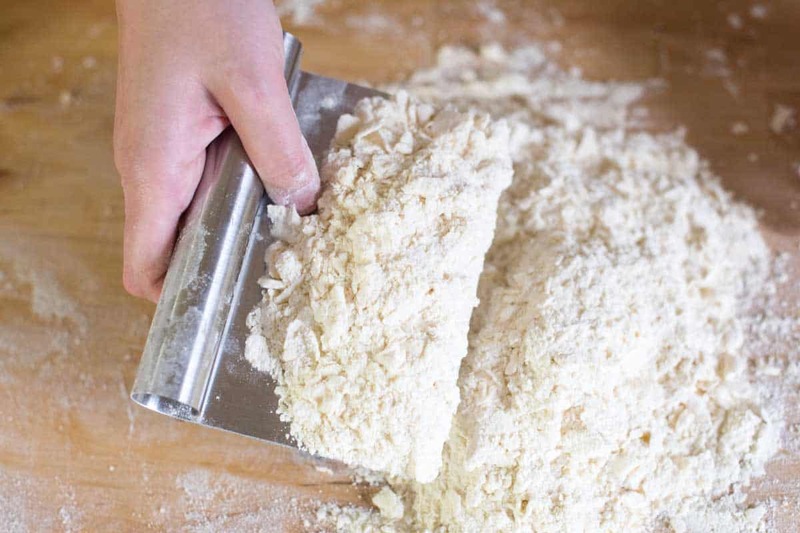 Cut the cold butter into the flour until coarse crumbs form. This recipe is really close to the authentic southern biscuits I grew up with. My Mom mixed them on the counter just as her Grandmother taught her. The only difference, aside from actual measurements, is that traditional biscuits are made with shortening. Biscuits are buttered at the table, to each person’s individual taste. I have always had an aversion to using shortening, but when it comes to biscuits, I promise you there’s no better fat for taste and texture! Mom pats the dough out and then uses an old can (like from beans or vegetables) to cut them out. The last bit of the dough is hand formed and that one is extra special. It’s called the hoe cake and is always the first one gone!